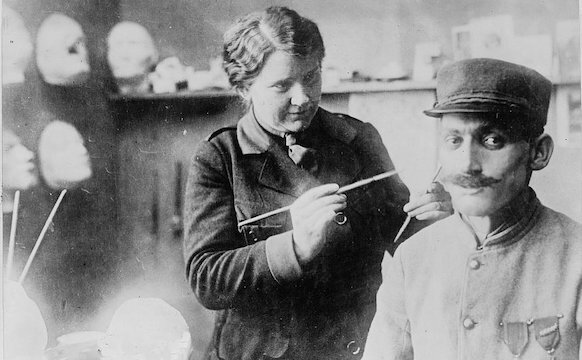 According to the Andrew W. Mellon Foundation, US museum staff have become more diverse — however, the margin of increase has been notably lower for people of color than women specifically. 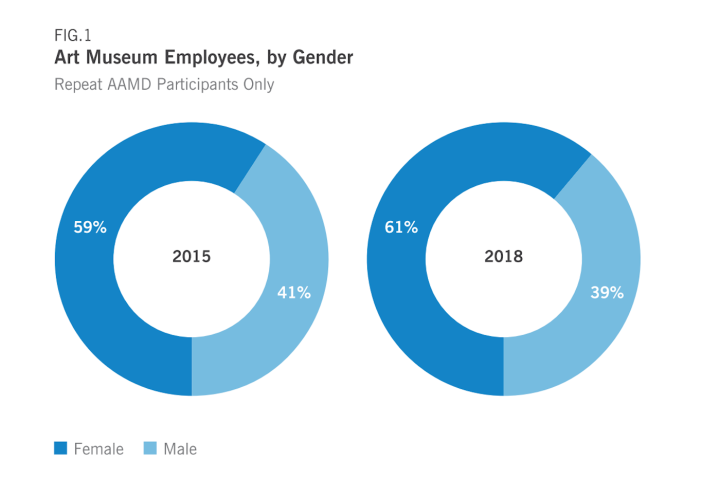 Graphic from the Andrew W. Mellon Foundation’s Art Museum Staff Demographic Survey 2018. 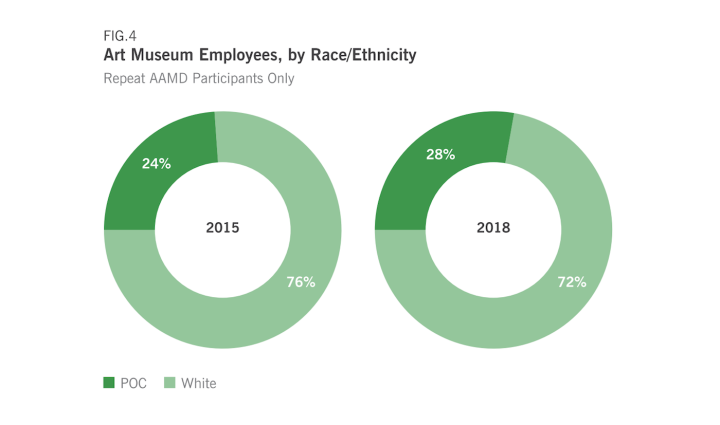 According to new data collected by the Andrew W. Mellon Foundation, diversity in museum leadership has increased in recent years — however, the margin of increase has been notably lower for people of color than women specifically, since 2015. 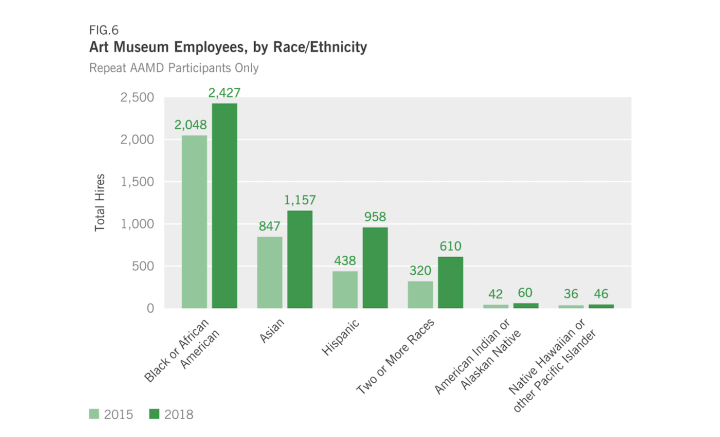 Today, January 28, the Mellon Foundation released the second Art Museum Staff Demographic Survey analyzing the ethnic and gender diversity of the staff of more than 332 art museums across the United States. Results show that the percentage of women in leadership roles — which comprise “all executive positions,” including directors, CEOs, and CFOs — increased to 62 percent, up from 57 percent in 2015, when the survey was first conducted. 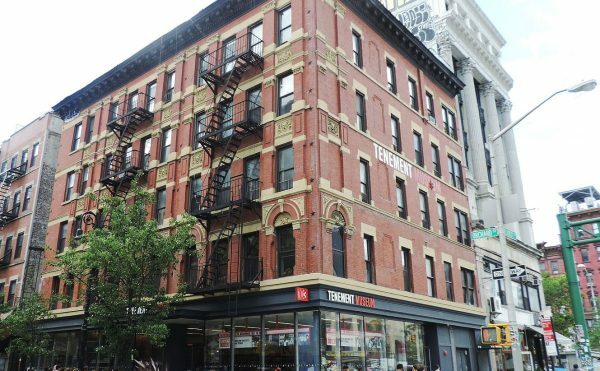 In this same period, the number of people of color holding these positions increased only from 11 percent to 12 percent. 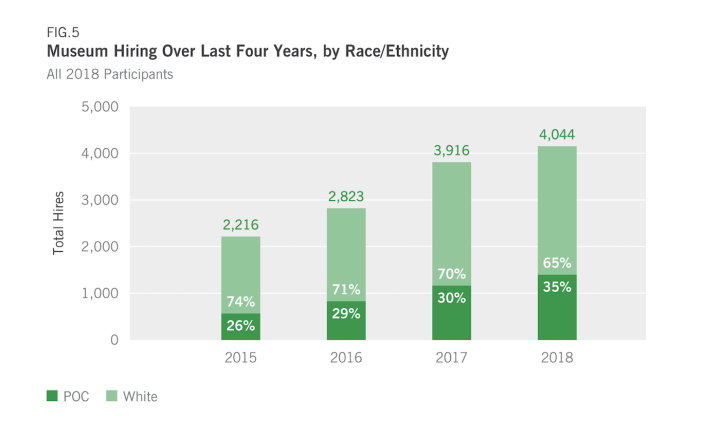 The percentage of African-American curators has doubled in the past three years, however, from just two percent in 2015 to four percent in 2018 — an increase of 21 positions. While curatorial and education departments have seen a substantial increase in hiring people of color in the last four years, conservation and museum leadership roles have not made this shift in hiring. In addition to planning for follow-up studies in the years to come, the Mellon Foundation is continuing initiatives like the Mellon Undergraduate Curatorial Fellowship, a program that offers curatorial training to college students from historically underrepresented groups.